Description: Screen Markup, Highlighter, and Capture Program. Expanded Description: This software is easily used in the classroom as it “sits” in the system tray until you have need of it. 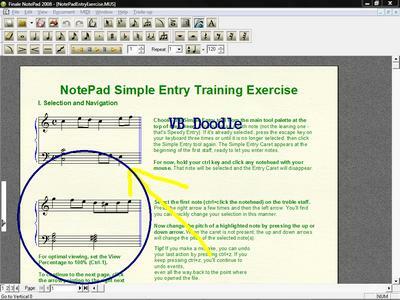 With VB Doodle you can easily draw, circle, highlight, and write text on the screen of any program you are running on your desktop. In addition, you are also easily able to save your drawings as a bmp, jpg, or gif for later use or recall. It’s easy to use and includes a detailed help file. Although it’s not a “music freeware” specifically, it may be used in conjunction with any music program you are working with on your computer.